Port-la-Joye—Fort Amherst National Historic Site of Canada commemorates the first permanent European settlement on Prince Edward Island. Grassy ruins of the British fort are still visible, and interpretive displays give visitors an appreciation of the site's history. 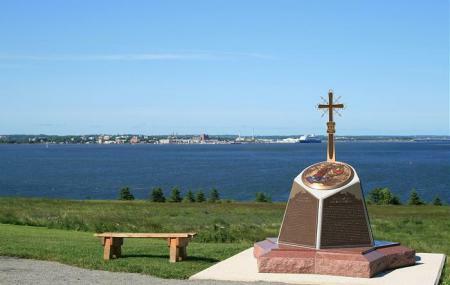 But what this site is truly famous for is the beautiful views of the Charlottetown harbor. Full of inviting pathways and gorgeous scenery, this place is full of historic adventures. Other Hours: The grounds are open from May to November and the site is staffed daily from mid-June to September from 9 am to 5 pm. How popular is Port La Joye Fort Amherst? People normally club together Argyle Shore Provincial Park and Beaconsfield Historic House while planning their visit to Port La Joye Fort Amherst. I enjoy the well maintained trails here when I want to walk in the sun and chat with my walking companions. The recent emphasis on First Nations history is long overdue. The view of Charlottetown harbour and the city is great. Good place to watch the cruise ships leave in the evenings. Very interesting historical location. Today, all that remains are mounds in the ground, so for someone coming from the Aulac Fort, it may be disappointing. But the views of Charlottetown are impressive by themself, so I would recommend going anyway. I really enjoy walking here, the park is well maintained and the views are awesome! A peaceful spot with a good trail system to get one around. Midweek was when we went and it was great to have the place to ourselves to enjoy the views and the history. Great locarion for an afternoon of walking and historically exploring!